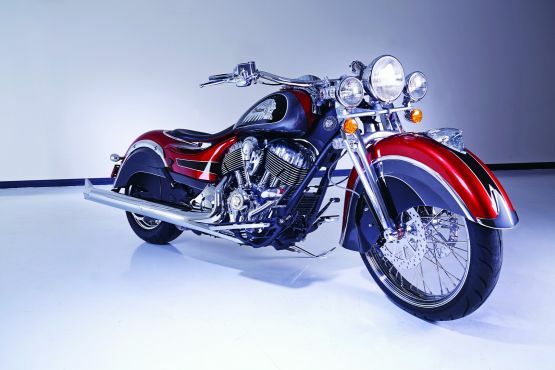 The International Motorcycle Show in New York City saw American two-wheeler veterans Indian unveil a completely customised version of their Chief Classic motorbike called the ‘Big Chief Custom’. 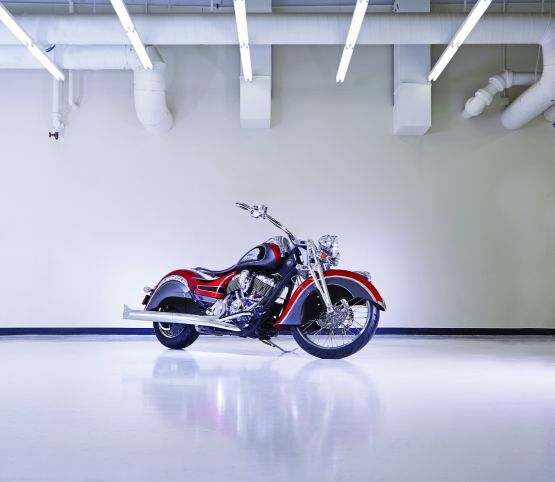 Decked in an array of Indian’s aftermarket accessory options, the whole point of this one-off, in-house custom job is to throw the spotlight on the Chief’s versatility and customisation potential. Judging by the pictures, it seems like they got what they wanted, because the bike looks spectacular, and can easily be set apart from the stock Chief Classic. The Big Chief is based on the 2014 model of Indian’s Chief Classic which came out a few months ago, and as per our coverage from a few days ago, the Indian Chief Classic is part of Indian’s line up that will be sold here in India soon. This singular custom has been given a thorough makeover, from top to bottom. Highlights include the front fender, new headlights, custom forks, and an absolutely unique paint job with a variety of colours which echoes the livery of Indian bikes from a bygone era. Most of the other add-ons such as the fish tail exhaust pipes, the beach style handle bars, and the covers for the camshaft and the primary drive can all just be bought from Indian themselves, and then bolted onto their bikes. The bike’s power mill, mechanics, and electric components haven’t been altered though, and it is still powered by the stock 1,811 cc fuel injected engine that is capable of producing 162 Nm of torque.